Let Flat Fee Locksmith North Hollywood by Lock solutions Inc turn your House into a safe & secure Home for your Loved ones by installing High security Medeco locks. Medeco is a locksmiths first choice in High Security door Locks, It is truly a Pick Proof, bump proof & restricted key lock. The Best in the Locksmith Industry. It is highly recommended that every business “Big or Small” should secure their premises with Medeco Locks. 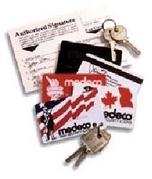 It provides great key control, you no longer have to worry if an employee duplicated your key. They Can’t!